I have been on a quest lately to try out stronger, weatherproof materials that I will be able to handle without using special equipment. In this round, I have been playing with cement and mixing it in a metal pot. I put a thin coat over a clay figure that I created for the sake of experimenting. I like the rough texture of it, but I would like to be able to smooth it out a bit more than I already tried to do here. My next material will be stucco as I have been reading good things about it and how it’s a bit easier to work with. First Mini Maker Faire at Barnes and Nobles in Forest hills! This past Saturday was my first and Barnes and Nobles’ first Mini Maker Faire. I wasn’t sure what exactly to expect, whether I would be on a panel or if I would just be demonstrating how I go about making my dolls. Luckily for me they just expected me to show my dolls to people and explain how I construct them. Seemed easy enough, but what I didn’t know was that I would be the first table directly in front of the elevator on the second floor in the children’s department. I love children and all but I WAS NOT READY lol! The staff had to sneak me out so that I could take a break and they also had to block the children so that I could pack up to leave when it was time for me to go. 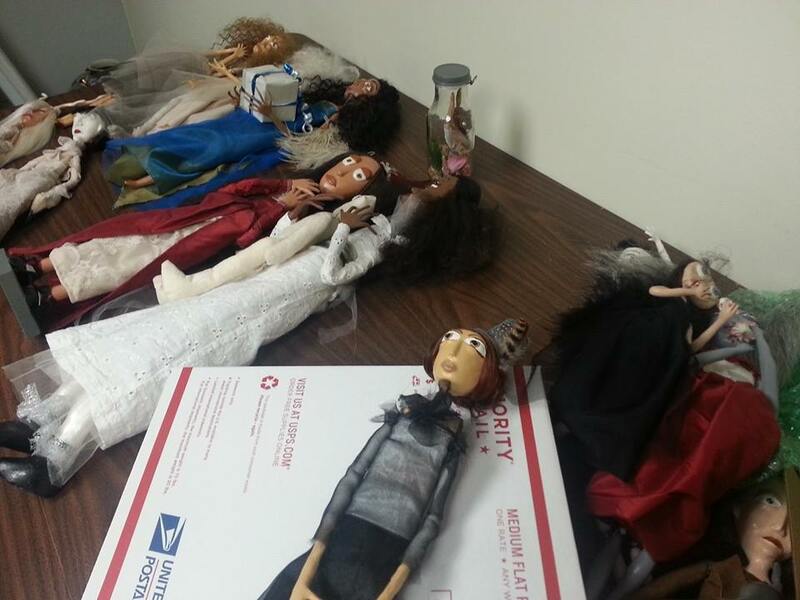 I really enjoyed them, they asked me everything from how I made the dolls to why did they look so sad. One was extremely pro-active, she had her mother take a tally of all the materials I used so that they could pick them up and get to work on making a doll that very evening. Another little girl outed her mom who secretly called my dolls creepy by shouting “I don’t think they’re creepy, I love them!”. She gets a gold star in my book for coming to my defense. Overall, the staff was amazing, the children were adorable and inquisitive and I went home without any of the promotional cards that I brought with me. I have a load of new items that will be slowly trickling into my Etsy shop over the next few weeks. (I take a really long time to list items, they need to be properly photographed and documented). The influx of items is a result of an outdoor art show in The Bronx’s Little Italy area being a total washout! It was such a sad day, there was little to no foot traffic and there was at least one artist that I know of whose art was damaged by the rain. Thankfully there was a 99 cents store nearby where I was able to get a beach umbrella to shield the few pieces that I did choose to put out. No Melandollies were harmed in the making of that show. There may be a second or third date scheduled for it but in the mean time I’m putting my new pieces up for sale in my Etsy shop. Getting ready for the show made me realize a very important thing, I work much faster than I think I do. In about 3 months time, I cranked out 18 small wall pieces/ornaments, 9 dolls in frames, 2 busts and about 20 small people in bottles. There were plenty of late nights and events that I had to miss but in the end it made me realize my capabilities. At one time it would take me 3 months to create 2 dolls, boy have the tides turned! Well in the mean time, you can check out the few items that I currently have in my Etsy store. I will keep you all posted when I add my new pieces to the shop, hang tight!